My parents own a little place just outside of Phoenix, AZ, where they escape the damp and dreary Vancouver Island winters. We often spend holidays with them, and on this particular visit I was really keen on trying a Waffle House. I assume you’re aware of my love for all things breakfast: everything from strawberries & whipped cream pancakes at IHOP, to banana stuffed French toast at the Twisted Fork in downtown Vancouver. Therefore, any chance I have to try a new breakfast spot, I’m all for it. 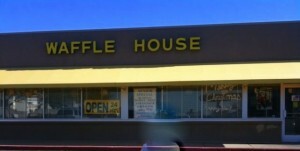 Since the Waffle House chain isn’t available in Canada, I was really eager to try one before we left Arizona. For reasons I can’t recall, the Waffle House nearest to my parents’ home was closed, so we had no choice but to drive out to the Apache Junction location to succumb to my waffle craving. 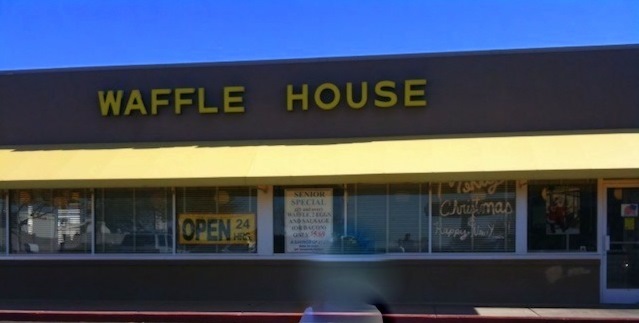 Considering this Waffle House was a stand-alone location with a large parking lot, I was expecting the restaurant to have a more spacious interior. The place was completely packed full of customers! Like a classic 50s looking diner, counter seating faced an open kitchen, allowing patrons to watch cooks hustling over the grill. Evidently, we had to wait for a booth, but staff provided free coffee to all waiting customers seated in the lobby and standing outside. Service was lightning fast and no-nonsense. 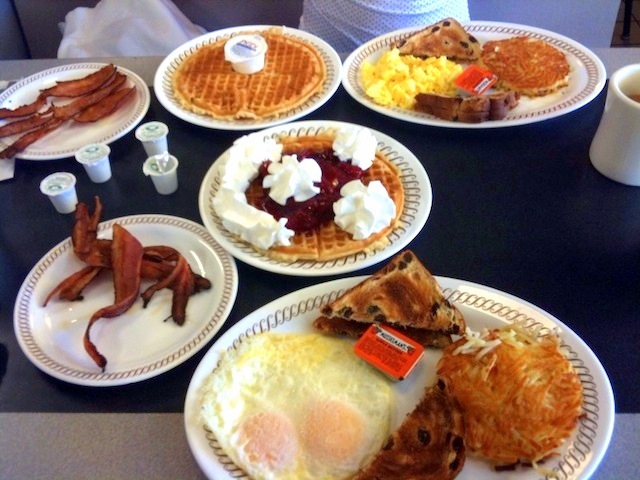 We ordered two All Star Specials ($6.30) with extra crispy bacon, raisin toast, two eggs, waffles, and hashbrowns. I added strawberries and whipped cream, and received a smiley-face on my waffle. 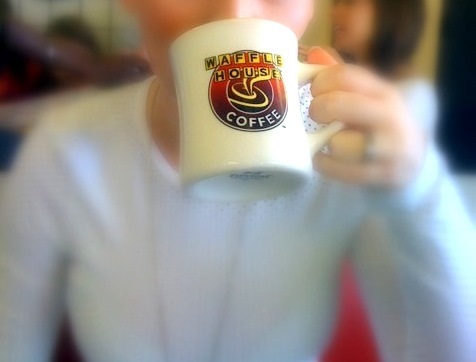 Their premium Waffle House Coffee ($1.75) was hot, freshly brewed and constantly refilled. Our relatively inexpensive breakfasts consisted of a substantial amount of food – I couldn’t even finish my entire meal.